Securely located on Castle Island in Loch Leven, Lochleven Castle had an important role to play in Scotland's history for over three hundred years. Yet it is perhaps best remembered as Mary Queen of Scots' prison from June 1567 to May 1568, and the place where she was forced to abdicate in favour of her infant son James VI on 24 July 1567. Today's visitor approaches Lochleven Castle in the same way as William Wallace, Robert the Bruce and the many Scottish Monarchs who visited, including Mary: by boat. Signs from the centre of Kinross direct visitors past a housing development to a car park on the west side of the loch and here you find the pier used by the Historic Environment Scotland ferry that carries visitors to the island castle. The reception and ticket office is set into the side of the bistro near the pier. The boat trip to the island takes ten minutes, and en route you gain interesting views of a church and churchyard on the north side of the loch, and of Kinross House. What you find when you arrive on the island is a remarkably complete example of a "castle of enclosure", an irregularly shaped curtain wall preserved from later quarrying by the castle's island location, complete with an unusual and probably very early tower house at one corner and the remains of a smaller circular tower at another. In two senses, the first impressions you get today are misleading. In the years around 1830 the water level in Loch Leven was lowered by over a metre and the island on which Lochleven Castle stands quadrupled in size. In its days an an active royal fortress the full castle occupied virtually all of the then much smaller island. And although well preserved, what you see today is perhaps only a half of the castle that originally stood here. The sequencing of the various curtain walls is unclear, but for much of its life what you see today formed the inner courtyard of the original castle. Less remains of the outer courtyard, which would have housed ancillary buildings and accommodation plus the gardens walked by Mary Queen of Scots during her captivity. The outer courtyard would also have been enclosed by a curtain wall that extended north of today's gateway almost as far as the disused visitor centre and (still in use) visitor toilets. The most significant structure within the castle is the tower house, which could easily date back to the very early 1300s, making it one of the oldest in Scotland. It is unusual in being accessed at the second floor level (rather than the more normal first floor level), but otherwise comprised the usual vertical stack of rooms and functions. At the second floor level would have been the lord's hall, with two levels of (now roofless and floorless) apartments above it. Mary Queen of Scots spent most of her imprisonment in the upper part of this building. Below the hall were the first floor kitchens, accessed by a spiral stair from the hall, while on the ground floor, and originally accessible only via an hatch and ladder, were the storage cellars. In the 1800s, in order to assist access by early tourists then starting to visit the castle, a door was knocked through into the cellar from the outside and steps built from the cellar to the kitchen. On the other side of the courtyard is the Glassin Tower, one of two circular towers added to improve the defences in the early 1500s. Largely a shell today, you can still gain an impression of the (lack of) space available to those living here. Elsewhere in the inner courtyard you can see traces of other buildings that would once have stood here. These included additional accommodation, a great hall to supplement or replace the earlier one in the tower house, and another kitchen. The Lochleven Castle you see today dates back to around 1300 when it was either built or occupied by the English troops of Edward I, until captured by William Wallace, under cover of night. Wallace, being less gallant than Mel Gibson, then killed the 35 English defenders and their five womenfolk. This was probably just the last of a series of fortresses on the island stretching back at least as far as one built here by King Dongart of the Picts in about AD490. 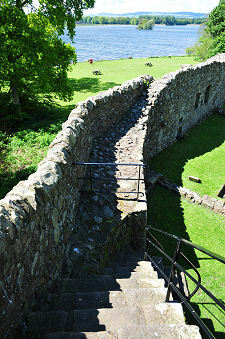 In later years the castle was visited by a succession of Scottish Kings including Robert the Bruce; David II (whose troops successfully defended the castle against English attack in 1334); Robert II (first as a prisoner and then as King); and of course later, often, by Mary Queen of Scots, first as Queen then as prisoner. 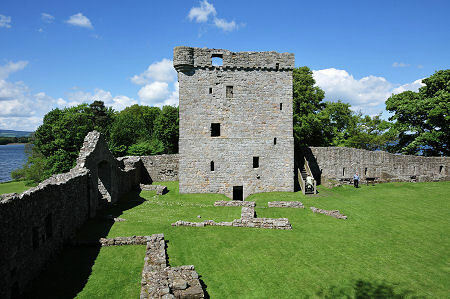 Lochleven Castle was passed by Robert II to the Douglas family in 1390, and after the focus of the Douglases' interests shifted to Aberdour Castle in the 1590s it started to fall into decline. In 1675 it was sold to Sir William Bruce, the designer of Holyrood Palace. 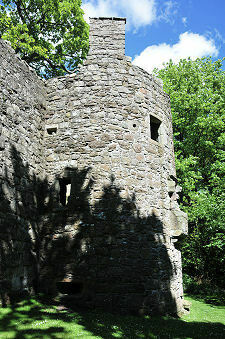 His main interest in Lochleven Castle was a decorative one. When he built Kinross House for himself on the western shore of Loch Leven between 1685 and 1693 it was designed specifically to face squarely across to what was by now becoming the romantic ruin of Lochleven Castle. 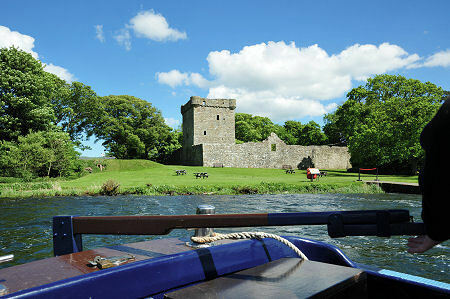 Lochleven Castle has a lot to offer the modern visitor. Any island is special, and the boat ride adds a great deal to the experience. It is worth bearing in mind, however, that we have never encountered as many flies (rather than midges) anywhere in Scotland as on Castle Island. While repellent does help, it is advisable to visit on a windy day, which seems to limit these creatures to the more sheltered corners of their domain.